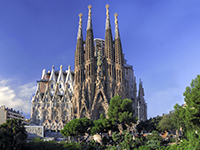 From its luscious beaches to remarkable monuments such as Sagrada Família and the Royal Palace of Madrid, Spain is a universally popular holiday resort for families and friends to visit. Around 12 million British nationals visit Spain each year, which can be accessed by either airplane, train, ferry or car from the United Kingdom. Travelling by airplane from Birmingham to Madrid should take around five hours, on average, while taking the train can result in a 10-hour journey if you leave in the morning. Leaving the UK by train in the evening will require a second day of travel. Taking the ferry to Spain will again see you spend roughly a day travelling, at least between Portsmouth and Bilbao, but that is without the addition of any other transport to further locations. Driving from London to Madrid, meanwhile, will take around 17 hours, which will increase to roughly 20 hours if you are driving further south to Cordoba, for example. Spain is one hour ahead of British Summer Time and two hours ahead of Greenwich Mean Time. If you are unsure as how to manage your diabetes in Spain, you should discuss this with your diabetes team prior to arriving. Spain is incredibly warm during the summer, with average temperatures of around 22°C lasting throughout June and September. Considerable heat can lead to enhanced insulin absorption and it is critical for insulin takers to check blood sugar levels scrupulously. You could consider reducing dosages, especially before periods of physical activity, if you are worried about hypoglycemia. The currency in Spain is the Euro, although many restaurants, hotels and shops will accept credit and debit cards for certain purchases. ATMs are also scattered frequently across all major Spanish cities. There are no mandatory vaccinations required to enter Spain, however rabies is present in bats in Spain, so it is advised for those planning activities in remote areas that put them at risk for bat bites to receive a rabies vaccine. Have you got your European Health Insurance Card (EHIC)? Spain is amongst the European countries that allow you to receive state healthcare either at a reduced cost or sometimes for free when on a temporary stay. It will cover you for medical treatment until you return to the UK. The Spanish health authority will determine if the treatment you require is considered necessary and which cannot wait until your return to the UK. Medication is available in Spain, but payment is required from a pharmacy, for which the Spanish translation is “Farmacia”. However, possessing an EHIC card allows you to receive treatment at a lesser cost and this money can be recouped when you get back into the UK. Blood and urine testing kits are available from any pharmacy in Spain. The emergency services telephone number in Spain is 112. Note which syringes are available in Spain, with U-100, U-80 and U-40 syringes the most commonly used. It is important to note any of the diabetes associations in the country, or countries, that you are travelling to. What language is spoken in Spain? Spanish, although many locals will have a basic grasp of English, especially those that work in a customer service environment.